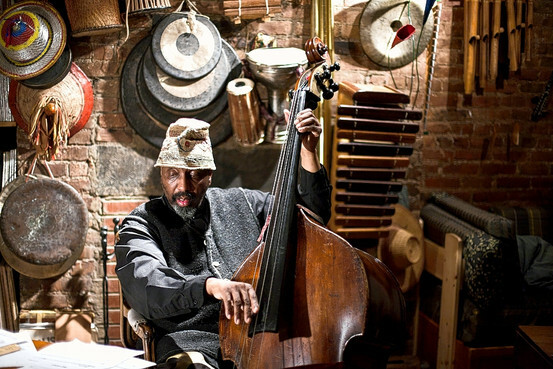 William Parker is a musician, improviser, and composer. He plays the bass, shakuhachi, double reeds, tuba, donso ngoni and gembri. He was born in 1952 in the Bronx, New York. He studied bass with Richard Davis, Art Davis, Milt Hinton, Wilber Ware, and Jimmy Garrison. He entered the music scene in 1971 playing at Studio We, Studio Rivbea, Hilly’s on The Bowery and The Baby Grand, playing with many musicians in the avant-garde school such as Bill Dixon, Sunny Murray, Charles Tyler, Billy Higgins, Charles Brackeen, Alan Silva, Frank Wright, Frank Lowe, Rashied Ali, Donald Ayler, Don Cherry, Cecil Taylor, Jimmy Lyons, Milford Graves and with traditionalists like Walter Bishop, Sr. and Maxine Sullivan. Early projects with dancer and choreographer Patricia Nicholson created a huge repertoire of composed music for multiple ensembles ranging from solo works to big band projects. Parker played in the Cecil Taylor unit from 1980 through 1991. He also developed a strong relationship with the European Improvised Music scene playing with musicians such as Peter Kowald, Peter Brotzmann, Han Bennink, Tony Oxley, Derek Bailey, Louis Sclavis, and Louis Moholo. He began recording in 1994 and leading his own bands on a regular basis founding two ensembles, In Order To Survive, and The Little Huey Creative Music Orchestra. In 2001, Parker released O’Neal’s Porch, which marked a turn toward a more universal sound working with drummer Hamid Drake. The Raining on the Moon Quintet followed, adding vocalist Leena Conquest and the Quartet from O’Neal’s Porch. Most notable among many recent projects is the Inside Songs of Curtis Mayfield. He has taught at Bennington College, NYU, the New England Conservatory of Music, Cal Arts, New School University and Rotterdam Conservatory of Music. He has also taught music workshops throughout the world including Paris, Berlin and Tokyo and the Lower East Side. Parker is also a theorist and author of several books including the Sound Journal, Document Humanum, Music and the Shadow People and The Mayor of Punkville. In 1995 the Village Voice characterized William Parker as “the most consistently brilliant free jazz bassist of all time.” However from the beginning of his career Mr. Parker has commanded a unique degree of respect from fellow musicians. In 1972 at the age of 20, Parker quickly became the bass player of choice among his peers. Within a short time he was asked to play with older, established musicians such as Ed Blackwell, Don Cherry ,Billy Higgins, Sunny Murray, etc. In 1980s he became a member of the Cecil Taylor Unit, in which he played a prominent role for over a decade. He also played with Milford Graves and Bill Dixon. In 2013 he was the recipient of The Doris Duke award.